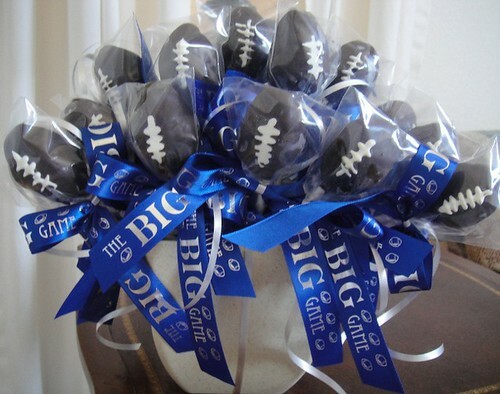 These are the perfect sweet treat for any football party. Whats even better is they are on a stick so they are easy to grab and munch! You can either use lolly pop sticks for small bite size cake pops or use pretzel rods for larger ones. I used pretzel rods because that's what I had on hand and they work out great. The rods under the cake did get a little soft but people still enjoyed them and it wasn't so noticeable because the softness of the pretzel mimicked the softness of the cake. Bake cake according to package instructions. It doesn't matter what kind of pan you cook it in because you will be crumbling it up anyway. Once cooked allow to cool completely. Once cooled, place cake in chunks into food processor and pulse until finely chopped. Or break up with your hands, just make sure the cake is in small pieces. Add 1/2 cup frosting into the cake and mix well. This will provide the consistency for you to shape into footballs. OK here's the messy part. If your using pretzel rods use about 1/2 cup of the mixture, for sticks use about 1 tbl. Take the mixture and shape round the rod or stick until it resembles a football. It helps if you rinse your hands if they become really messy. Place on wax paper lined cookie sheets and refrigerate at least 1 hour. After footballs have cooled in fridge prepare the chocolate chips. Melt them over a double boiler with 2 tbl vegetable oil. Dip each football in the chocolate allowing excess to drip off and place back onto cookie sheet to set up. Mix 2 cups of powdered sugar with water, 1 tbl at a time until it is in a thick paste form. Place in a sturdy zip loc bag or piping bag with small tip. If using zip loc just cut a tiny tip off the end. After footballs have set up pipe the lacing onto the football with the powdered sugar frosting. Allow to set. For a creative display, cover a piece of styrofoam with green paper and draw on a football field. Stick the pops into the styrofome and serve! You will need to use the lolly pop sticks in order to do this display.